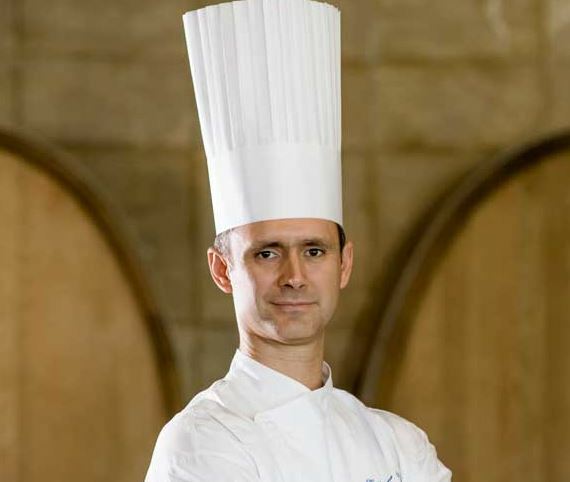 French-born Guillaume Morancé studied at the Hotel School of Brunoy and holds the "Brevet d'études professionnelles" (BEP), both of great importance in the culinary field. He started his career serving in some of the best hotels in Paris, such as the Lancaster and Le Meridien, and later in the prestigious Potel et Chabot, serving gourmet banquets in New York, Saint Petersburg, Moscow, and Paris. He participated in major events such as the Rolando Garros Tennis Tournament and others at the International Air and Space Show in Paris-Le Bourget. In 2001, Chef Morancé opened his own international cuisine restaurant "Bistro 21" in Michoacan, Mexico. When asked how his journey began, he replies that it was essentially because he loves food! He is convinced that a good chef must be a good diner; a "bon vivant". Chef Morancé also believes that great dishes cannot be created if they are not of your own whims. His motto is: "Make it simple to succeed", as he does not like to complicate things. He is drawn to simple cuisine where the ingredient is the star; this allows for creativity, the perfection of cooking and seasoning to flourish. He also enjoys creating emotions, which, combined with excellent customer service, not only satisfy the palate but also each person's heart. Being a chef has given him the opportunity to travel and learn about the gastronomic specialties of other countries, and this has helped him form his own style. In addition, he is a member of various prestigious associations such as Maîtres Cuisiniers de France, the Culinary Academy of France and the brotherhood of the Chaîne des Rôtisseurs. He has now accepted a new challenge: To lead the kitchens of Grand Velas Riviera Nayarit as Executive Chef, where his creativity and passion will be delighting diners with unique and unparalleled dishes worthy of his reputation.